Hey girl, hey! I’m just an apple crips. I want to be in your tummy. COME TO ME! I want you guys to picture me holding a basket of apples while dancing around pumpkins because that is exactly how this recipe made me feel. I bought a bag of granny smiths apples, took one bite, and then realized how I absolutely dislike granny smith apples. They’re bitter and hard to eat. I was incredibly unhappy. It’s apple season and I bought these because they looked beautiful. Then and there, I decided that these apples would become a pastry. I didn’t know what at first and was given many lovely recipes I must try. 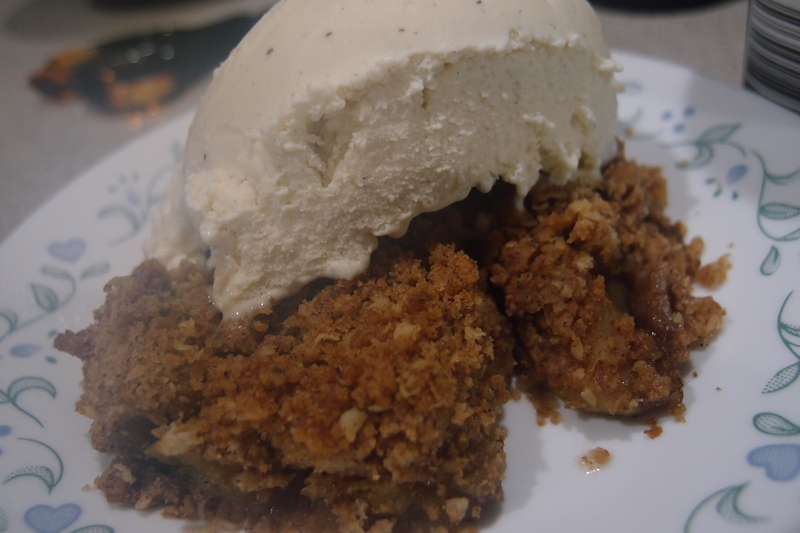 The apple crumble is what I came up with! It has a graham cracker crust because graham crackers are delicious and I had a box full. If you know me, you know that I’m all about using whatever I have on-hand. I’m an apple crumble topped with vanilla ice cream. Look at how beautiful I am. LOOK AT ME! My picture is a little blurry because I’m so steamy. 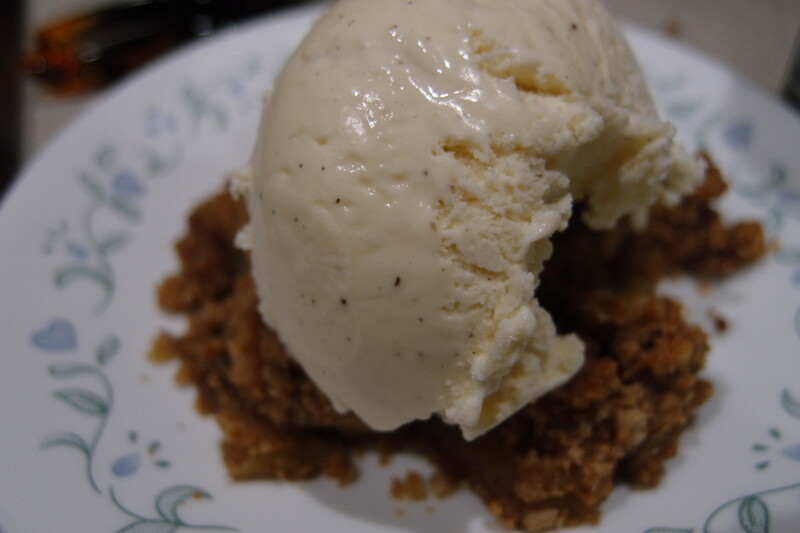 This is a naked apple crumble. It’s still just as delicious. During a cool autumn evening, rake the beautiful leaves into a pile, and then kick them! This ritual of reckless enthusiasm will allow the oven to preheat properly at 375 degrees. First things first, you need to slice and peel your apples. You can dice them if you’d like but I like to slice them. Sometimes I like to pour some lemon on the apples. It helps them not turn brown or oxidize quickly. But since this recipe browns apples anyway, I think it’s kind of unnecessary. In another bowl, melt 4tbs of butter. Once the butter is melted add all of the filling’s ingredients and stir them together until they turn a beautiful brown color. This color is the representation of the now sleeping trees who are quickly turning brown in a conjoint effort to greet fall. Pour the contents of this bowl over the apples and stir. Make sure every apple is evenly coated in this mixture. This will ensure the apple crumbles sweetness. Each apple deserves to be coated in sugary love. It’s time to make the topping! I’ll be honest with you guys on this one. There are a ton of different ways you can make this kind of topping. You can add some chopped almonds or any kind of nut, all kinds of sugars, different types of cookies too. This is the one I like to use. In a large bowl, add all of your dry ingredients! You want to add the cold butter to the dry concoction and massage it into it until you feel that the butter is well distributed. Grease the dish you’re going to bake these lovelies in and then add your apples. 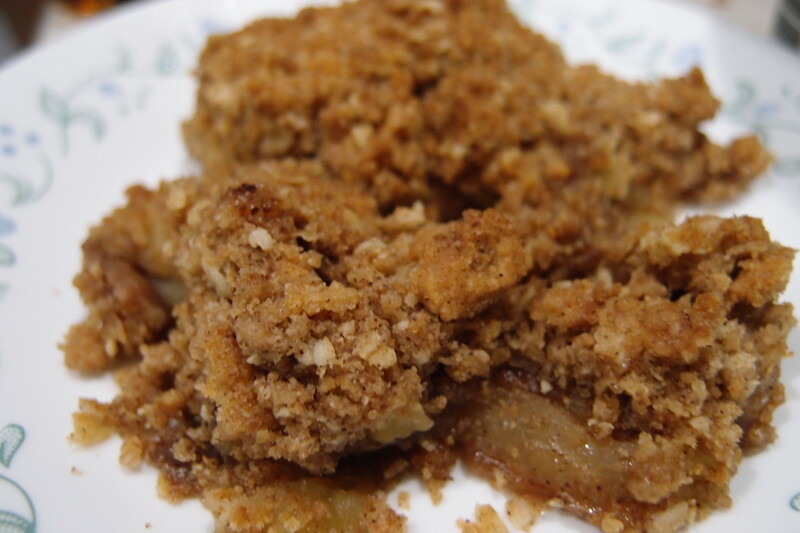 Once the apples are sitting happily in the dish, top them off with the delicious topping. 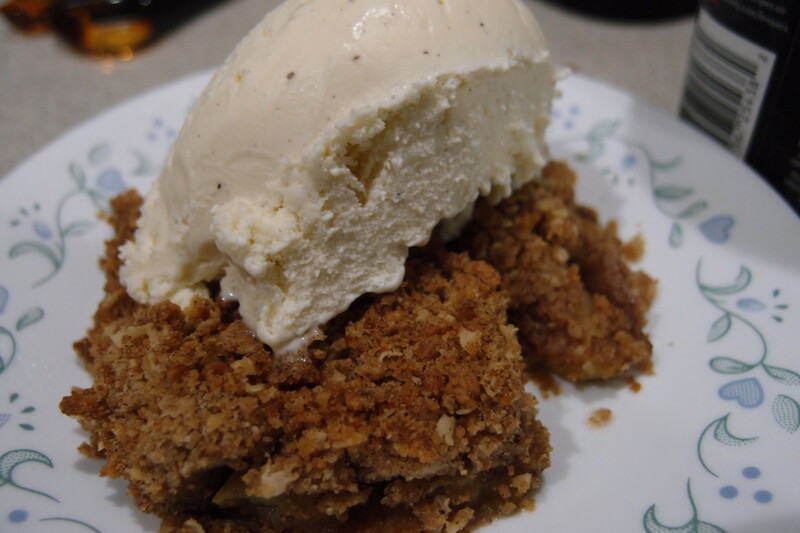 Bake this apple crumble deliciousness for 35-40 minutes or until the the crumble topping is golden brown. OH LOOK AT THIS! I HAVE ICE CREAM BACK ON! I have tried strawberry crumble and cherry and plum crumble they were good but after seeing your apple crumble very much tempted to make apple crumble. This looks so good! I need to have this for Thanksgiving! Or now. It definitely doesn’t need to be a specific holiday to have this crumble or any dessert. Dessert is life! Nom, nom, nom! I’m going to try to make this over the weekend, it looks so good! That’s great! Let me know how it goes if you do! I wish I could have some right now, and it’s six A.M. Truly tempting! I would totally share too! I endorse and approve of 6am snacking. That looks so good! Perfect for the fall. Thank you! It has the right kind of fall feelings baked right into it! I can’t believe I missed this yummy post. I followed you on twitter so I won’t miss anything as delicious as this again. Great! I’m glad you were able to see it. WordPress is being a tricky trickster with my posts.